Muvi Kart supports display of multiple variants of the same product on the same page. 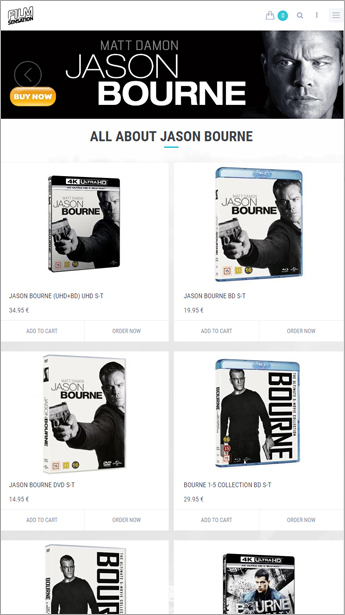 So, e-store owners can put different related SKUs (Stock Keeping Units) of the same product on the same online shelf. For example, a Shirt can have many variants in terms of colors and sizes. On Muvi Kart, the details of all variants of the same product will be listed on the same page. The same shirt will be available in all options on a drop-down box. There will be options for various colors (Red, Black, Blue, White, etc.) and sizes (S, M, L, XL, XXL, etc.) available for choice in the drop down for end users to pick a preferred variant and place an order. Convenience inside an e-store is a luxury and Muvi provides the same with aplomb. Add different images for different variants of a particular product and give your customers an effortless and happy shopping experience. More the images, solid is the presentation and easier is the decision making. As an e-store owner, broaden your product offering and consolidate related SKUs by displaying them on the same page. Include different variants of a particular product in the same window and make shopping experience faster and more convenient for your users. Your customers will be able to select a variant from the drop down and then place an order. So, you can assign each variant with a unique SKU code and track the current inventory and available stock for each product.